Let’s face it. Kids attract dirt. Unsanitary conditions in classrooms, playgrounds, school buses, and pre-schools are the perfect environment for kids to pick up bacteria and germs. Smog, poor air circulation and air conditioning also add to airborne pollution. By the time our kids get home from a hard day at school or play, the safest place for them to land is in a tub full of detoxifying Aromasaurus bubbles. 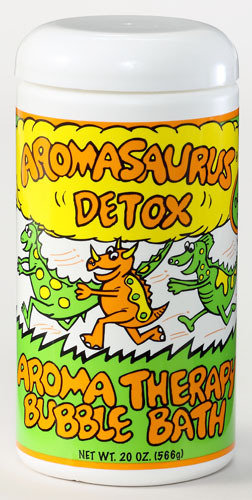 Therapeutic Effect: Aromasaurus Detox Bath, with its special blend of detoxifying natural herbs and essential oils, vitamins and minerals is the best natural way to protect your child’s skin cells from daily environmental toxins and promote a healthy immune system. Directions: Add 1 to 2 capfuls under running warm (98° to 100° F) bath water. Bathe for 15-20 minutes. Avoid chill. (State required advisory) Not recommended for children under 2 years old. 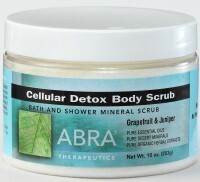 Click the button below to add the Aromasaurus DETOX - Grapefruit/Lemongrass/Dandelion to your wish list.